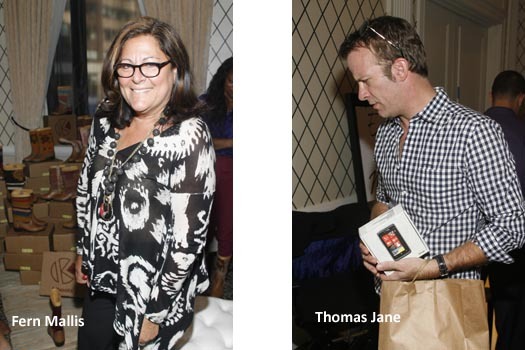 NEW YORK, Sep 13, 2011/ — Thomas Jane, Kaitlin Doubleday and Fern Mallis picked up Windows’ Phones (with service), enjoyed Voli and vitaminwater cocktails and Glo Brilliant teeth whitening today along with other notables Upstairs at the Allure Lounge at the Empire Hotel. Fashion can be tiring, so why not take your break in style. Upstairs at the Allure Lounge offers the best: take a few minutes to get a brighter smile with GLO, enjoy an Essie manicure, blow out with TIGI products and when your phone dies, Windows’ Phone will save the day. Celebs and fashionistas sipped on our complimentary cocktails by vitaminwater and Voli, a glass of Voga wine or Krup’s Coffee. The suite included the newest products on the market including celebrity stylist Ricardo Rojas’ Tango Brush Set, Eau de Nos Fragrance, Flo Atomizer, the perfect accessory for the fashionista on the go and our favorite emerging designers. It is the ultimate staycation across from the madness of fashion week.